How Much Does An Empty Bottle And A Full Bottle Of Wine Weigh? 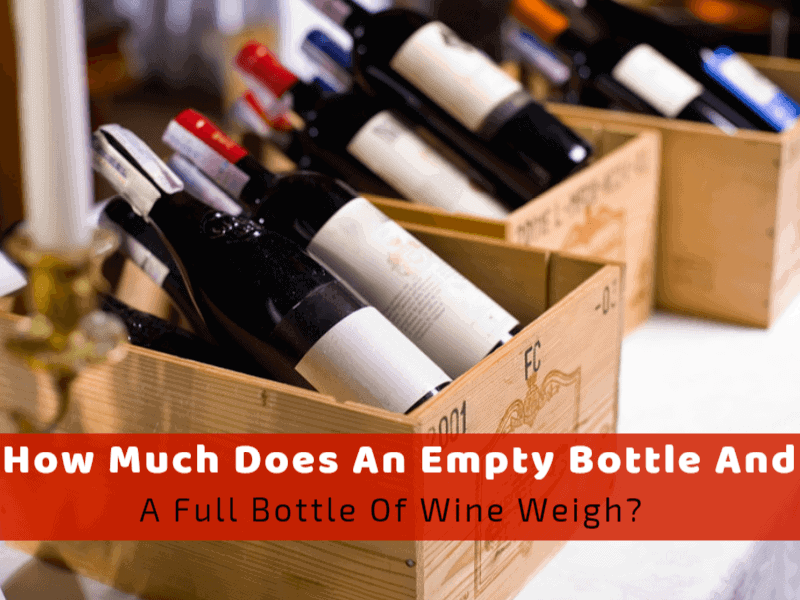 >> How Much Does An Empty Bottle And A Full Bottle Of Wine Weigh? Wine can be a classic gift choice for any occasion; birthdays, anniversaries, retirement, weddings or for thank you gifts. Selecting the right wine can be a difficult task, especially if you're not sure of the type of wine the recipient prefers. But have you ever wondered how much an empty bottle and a full bottle of wine weigh? There are several criteria to consider when choosing the right bottle of wine for a gift. You'll want to consider the recipient's taste, nature of the occasion and purpose of the gift. The budget will definitely come into play, but there are always great wines to be found in every price range. We might otherwise appreciate small and light things, but when it comes to wine, the bottle weight and size has a lot to say about the quality of the wine. The wine bottle has had a long and interesting history. Ever since the Romans discovered that glass was a good medium to store wine, wine bottles have evolved into those we use today. Glass bottles are still the best way we have to store and preserve wine. Until the Romans became powerful, the wine was saved in amphorae (clay flasks). The Romans developed glass blowing and quickly found glass to be a good medium for storing wine because it didn't affect the wine's flavor and you could see what wine was inside the bottle. Wine bottles have a variety in the size and shape, and that’s why consumers never exactly knew how much wine they were getting. For a very long time, selling wine in a glass bottle was not legal. The major reason was bottle type, variation in the volume of the wine in every other bottle. Cheating the audience wasn’t difficult with these varied shaped wine bottles, and because of this, consumers use to bring in their own vessels for the amount of wine to be poured. If we talk about the weight of a wine bottle, just like the shapes and the sizes the weight also differs. There is nothing about wine that is straight-forward, and this maxim also applies to package, e.g., glass wine bottles. But, here are some rules that apply to wine bottles. The glass bottle is an important presentation for any wine, especially one that is not a mass market/commodity wine. Bottles are often perceived as a romantic element of the wine they contain. The weight of the bottle indicates perceived value and quality. Stylized bottles are not found in the lightweight glass. Glass bottles come in categories of quality just like corks and labeling. The wine container (in most cases a glass bottle) is part of the packaging, and frankly, most wine consumers don't give much thought to the bottle. To most wine consumers the wine container is all about a traditional glass bottle. But there are always other options: the wine box with a Mylar liner, picnic/hiking containers (stainless steel Wine Karafe), pouches, tubes, and kegs. There is a wine container for all occasions and applications. An empty bottle of wine may weigh anything between 300g to 900g. And there is this preconceived notion that the heavier the bottle, higher will be the quality of the wine. Depending upon the glass used and the shape and size of the wine bottle the weigh would differ. An average wine bottle with wine weighs about 3.3 pounds; some of the premium bottles weigh in at over 4.5 pounds. Then there are corks to buy. Premium wines use longer and better corks. Usually, a standard bottle of wine will have a little more than 25 ounces of wine and can weight nearly 2.65 lbs. To describe sales in the wine industry, a bottle has become a standard unit off late. It measures 750 milliliters (26.40 imp fl oz; 25.36 US fl oz). But as mentioned earlier the weight of the glass or the wine bottle is directly linked to the price of the Wine bottle for obvious reasons. Again, depending on quality, quantity, and style of bottle, a premium brand winery can expect to pay $0.70 to $1.00 per bottle, but that can go to $2.00 for some unique specialty bottles. A good high-end glass wine bottle with a mini-punt will cost a winery approximately $20/case. A boutique winery might pay $12/case for their $50 retail bottle of cab. A heavyweight bottle with a full punt from France will cost $25 per case, and yes, these bottles sell to California wineries producing high-end wines. Packaging plays an important role, from a marketing point of view- a heavy bottle is perceived as high-quality wine. And because of the difference it makes, marketers do give a lot of importance on the designing and labeling of the bottle. Historically, shapes define a white wine, red wine, and a dessert wine bottle. Within these categories, the bottle shapes get more consideration in height and diameter (the bottle and the inside neck diameter). The shape of the bottles also impacts the bottling process when the labels are applied. Furthermore, the bottle selection has a bearing on the label design, where the bottle shape dictates design dimensions. Most 750 milliliter bottles are about 11-12 inches high; the diameter generally varies from 3 to 3.5 inches, so size does matter. High-quality wine bottles come primarily from Italy and France. These bottles from Europe have thick walls and are quite heavy, with a case of these bottles weighing around 22 pounds. The cost per bottle for a premium 750 ml bottle from Italy, for instance, can be more than $3.50. The bottle price assumes a punted bottle although there are options in addition to the punt bottom including, flat and mini-putt. Should $3.50 per bottle (or even higher) be too expensive, there are other options you could consider. 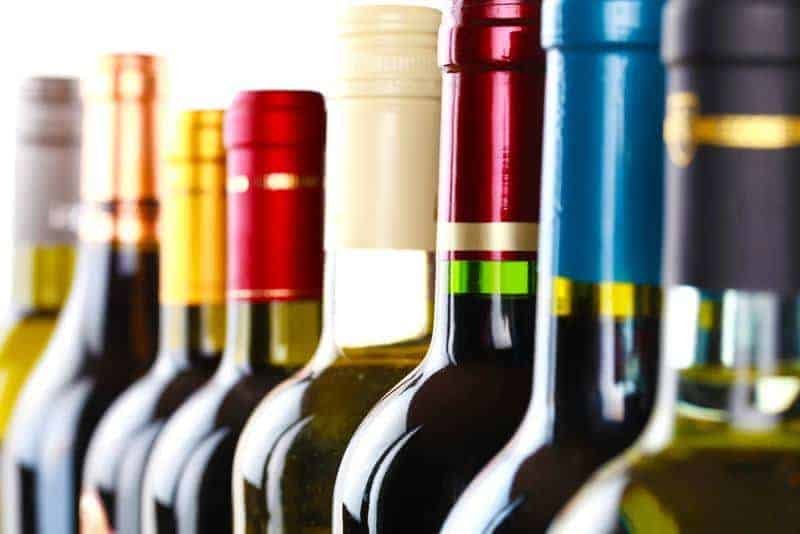 A domestic glass wine bottle producer will sell a case of bottles for $8-11 per case or by going to China a case of bottles could cost $6 if purchased in sufficient quantity. Most bottle companies in the U.S. that sell inexpensive China manufactured bottles ($0.60 each) have their own quality assurance people in the plants to oversee everything from raw materials used in the glass to manufacturing. Bottom-line, a high-quality heavyweight 750 ml wine bottle with a full punt will cost about $3.50 to $4.00, and it comes from Italy. A wine bottle is used to hold wine and is usually made of glass. A customary wine bottle holds about 0.75 liters of liquid. More traditional glass wine bottles are preserved with corks, but screw-top caps are becoming increasingly popular as well. In countries like Portugal, Germany, France, Spain, and Italy, determining the silhouette of wine bottles is heavily influenced by local customs. Champagne and sparkling wine bottles tend to be more thick-walled and expansive with a prominent punt and shoulders which slope, whereas Burgundy and Rhone bottles tend to be taller with smaller punts and sloping shoulders. One unique glass wine bottle would be for Chianti, as it has a flask which is round bottomed. In the 1800s, started making standard sized bottles. Bottles eventually became between 700ml and 800ml because that was a size that was easily made, and also easy to carry; although other special sizes did exist. In 1979, as part of the push to become metric, the US started to require that all bottles be exactly 750 ml. The European Union also asked their winemakers to agree on a standard size, somewhat the same time. The 750 ml bottle size has become adopted by many countries so that winemakers can ship their goods to the U.S. easily. Towards the middle of the 18th century, the diameter of the bottom of wine bottles was gradually reduced, and their height increased, which meant that the neck was shortened, but storage in the cellar was far easier. Wine bottles and quality wine became very popular. Development and differentiation in the shape of bottles improved their quality; there were a constant distribution and thickness of the glass, a sturdy and safe closure, and an even color. Specific bottles were used to produce wines from different regions. Typically these bottles were the result of farmers who made wine and also manufactured bottles to earn an extra income. It was in the middle of the 19th century that glass was produced using semi-automatic or almost industrial processes, and from the beginning of the 20th century, automatic machines were used. There was almost a sudden leap from the hand-made product to mechanical production, and glass-making technique improved rapidly with mechanization. Occasionally the consumer sees a mid-range, and even occasionally a premium winery offering a boxed (called alternative packaging) wine on the shelves. This container format has been around for 40 years and is not new. 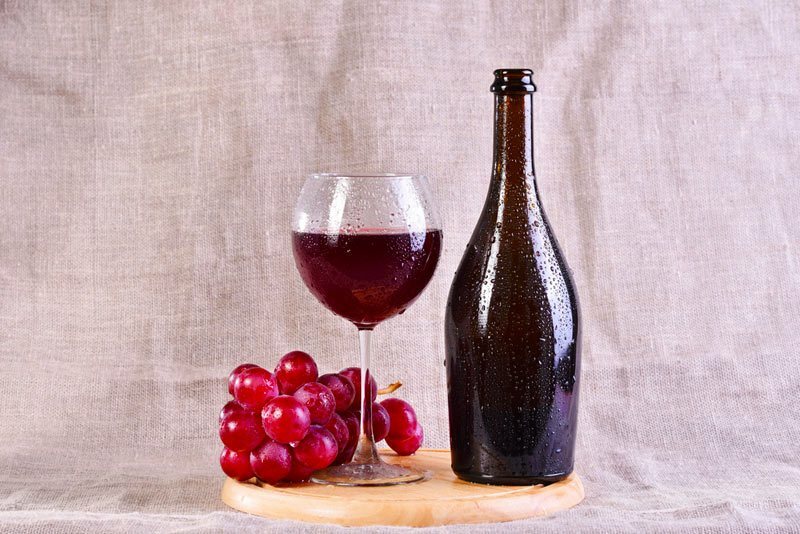 In addition, over the past few years, some manufacturers have started offering a lightweight glass wine bottle. Any of these non-traditional/alternative packaging options are really designed to reduce distribution costs by reducing weight and handling costs. Does Your Wine Weigh on the Environment? Though from time to time people keep raising their voice to lessen the use of glass, to lessen the environmental impact. But there has not been a lot of action in the wine industry. Just because people have this thought that heavy wine bottles are good quality wine they have been sold in the same way. Wines are generally imported, which means heavy wine bottles would need more energy to transport. Below mentioned are a few small steps that you can apply to lessen the environmental impact and enjoy your favorite wine without any guilt. Chose a Lightweight Glass Bottle. If we talk a beer bottle, they are much lighter in weight than they were 30 years ago. The Wine industry though has not adopted the trend yet. But once the consumer’s starts requesting lighter bottles, the change will definitely take place. Rather than going for heavy glass bottles that contributes to the carbon footprint, using an alternative packing such as plastic can help reduce it. There will be no change in the taste of the wine we have already read about that. Another option could be boxed wines, though the reputation has not been that great, with these easily recyclable boxes, which can replace 4 bottles and keep your wine taste fresh, you can become eco-friendly. Other than replacing those heavy glass wine bottles boxed wine has some other advantages also over the traditional bottle and cork brethren. Some wineries are putting a pretty good product into those boxes these days. The wine is stored in a plastic bladder which virtually eliminates air from having contact with the wine. Unlike an opened bottle of wine, box wine will stay fresher longer once it is opened. A better quality of the wine is now available in boxes. Several wineries are producing good box wine. Due to lower packaging costs, box wine can be sold in greater quantities at a lesser price than bottle and cork wine. Box wine is also thought to be more eco-friendly than bottle and cork. A shipment of wine boxes weighs less than a bottle and cork shipment. The reduced weight means fewer greenhouse gases are emitted during transport. The problem with boxed wine is, although more vineyards are getting into the game, there is still not enough choices and varieties of box wines available to the consumer. We need to get out of the stigma attached to it; the heavy glass wine bottles can be replaced. One cannot enjoy to the fullest with a burden of damaging the environment. The wine has been celebrated since 6000 B.C. ; it is one drink that is thoroughly enjoyed. There is nothing quite like sipping a fine wine when you want to relax- but that really doesn’t need to come in a heavy glass bottle that hurts the environment.